Dedicated to energy healing through Reiki, Reflexology, Jin Shin Jyutsu, Qi Gong, and Herbal remedies. Energy healing helps bring your body back into balance by reducing stress and cultivating relaxation. When you truly relax, your body can heal itself. Hours: Monday - Friday 10 am - 7 pm; additional hours by arrangement. Call/Text 404-406-5204 or email reikidancing@gmail.com to schedule an appointment. Standard 60-minute session is $65. The combo 90-minute Reflexology + Reiki is $95. Extended 90-minute Jin Shin Jyutsu is $95. "I have been having weekly reflexology since I developed plantar fascitis three years ago, and after the problem subsided, I still felt it was the best thing I do for myself and my health. I get overall relaxation and haven't had allergies or sinus congestion since I started. I recommend Christin and reflexology wholeheartedly!!" "I felt deep relaxation within the first 5-10 minutes. I look forward to how my body responds in the next 24 hours." "I felt alternatively like nodding off to sleep and getting up and exercising." "Thank you thank you! My legs were hurting for two months and pain is gone!! You do great work." 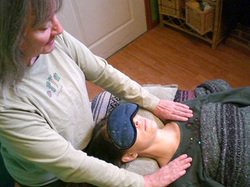 Reiki, a Japanese technique of "laying on hands," is recognized as an alternative healing modality by the World Health Organization (WHO). According to the National Institutes of Health Center for Complementary and Alternative Medicine (NCCAM), Reiki affects energy fields that surround and penetrate the human body. Click on the Reiki tab above to find out more about this gentle method for relaxation and stress reduction. Bring your body back into balance with foot reflexology! This combination of gentle stretching and foot compression can help reduce stress, improve circulation and stimulate the movement of lymph -- our bodies' natural detoxifier. To find out more about how reflex points on the feet work with the body's actual organ systems, click on the Reflexology tab above. Jin Shin Jyutsu is a gentle healing art whose origins go back thousands of years. Rediscovered in Japan in the early 1900s, it uses the innate healing energy of acupuncture meridians and balance points to help each person bring her- or himself into harmony, so the body can heal itself. Jin Shin Jyutsu (pronounced “ gin shin jute-soo”) is ideal for anyone who is dealing with pain, too much stress and / or a chronic condition that hasn’t responded to conventional medical treatment. To find out more, click on the Jin Shin Jyutsu tab above. the moon we're in, check out the Moon Phase Clock on the Herbalism page. Take a look at the diverse plant communities on Black Rock Mountain. Traditional Chinese Medicine (TCM) perspective, click on the Herbalism tab at the top of the page. To find out more, click on the Qi Gong tab above. I use Angie's List to assess whether I’m keeping valued clients like you happy. Please visit AngiesList.com/Review/9073118 in order to grade my quality of care and customer service.